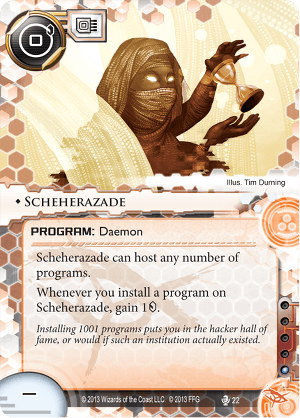 Whenever you install a program on Scheherazade, gain 1credit. Installing 1001 programs puts you in the hacker hall of fame, or would if such an institution actually existed. I was really underwhelmed until I created a weird Noise Hivemind deck with a recurring economy through Grimoire, Cyberfeeder, Aesop's Pawnshop, Cache (netting 8 ) and Gorman Drip v1. Now I always keep one of these around if I can splash and it returns me enough money to fund my few runs I do with a virus milling deck.